Adding red pomegranate arils to things is usually a good idea. Especially if you love pomegranate. 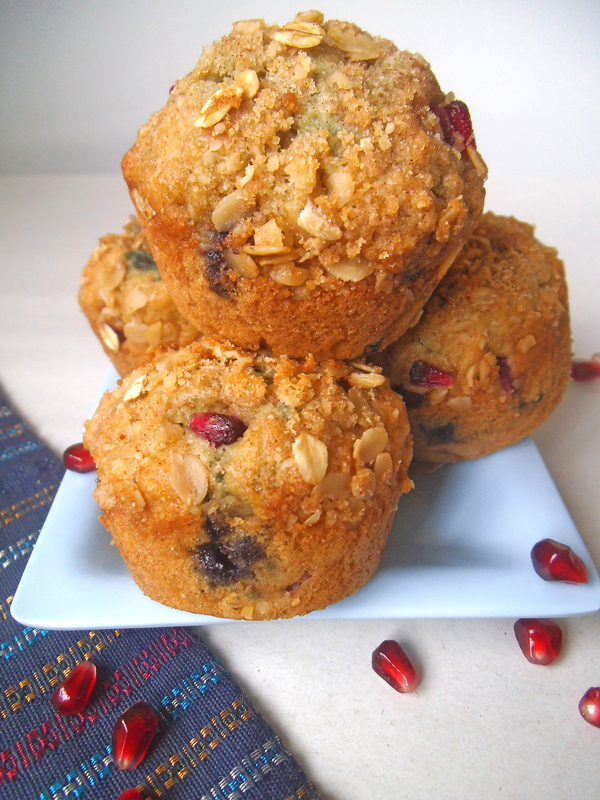 With blueberry muffins, here is an opportunity to add a little extra colour, flavour and crunch. The crumb topping gives a superb finish. With the first batch gobbled up quickly, it’s time to make more. Mornings, especially busy ones, just go better with muffins. And fresh, homemade muffins are the best! To make muffin batter, combine flour, baking powder, baking soda, spices and salt in a medium mixing bowl. In a separate bowl, stir together milk and lemon juice. Let milk curdle for a few minutes before adding egg, sugar, oil, and applesauce. Combine wet and dry mixtures and stir until ingredients are incorporated. Do not overmix. 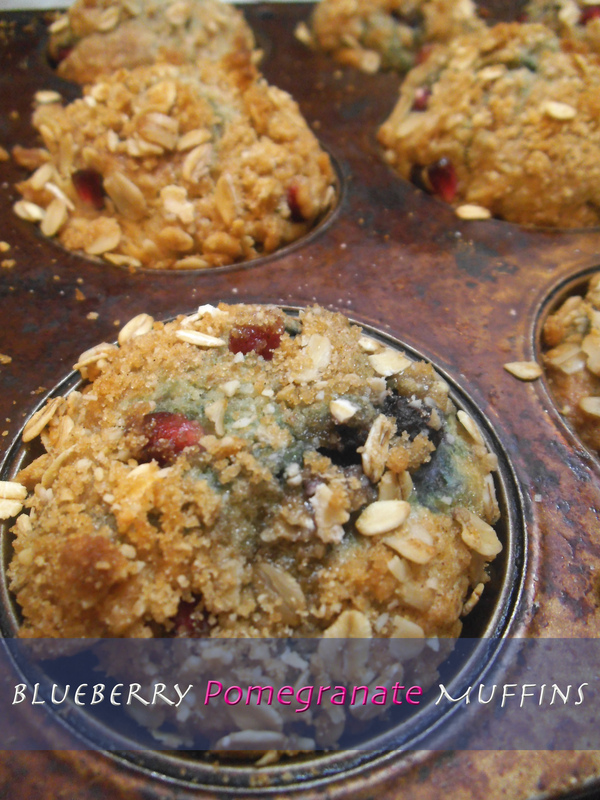 Gently fold in blueberries and pomegranate. To make topping, combine the oats, brown sugar, almond meal and cinnamon. Cut in butter or margarine with butter knives or blend together with fingertips until even crumbles appear. Pour batter into 12 greased or lined muffin cups. Pour crumble topping onto each portion of batter. Bake for approximately 15 minutes, until muffins test done. I share recipes here. These look amazing. I love pomegranates and my husband love blueberries. This a great combination of the two. Thanks for sharing on Saturday Dishes. We go through muffins like crazy and I love pomegranates…it helps that the arils are so darn gorgeous! Great recipe. Thanks, Anna! I’ve got another pomegranate recipe in the works too. 🙂 I’m so happy that they are back in season!